Razor’s new E300 has been the dominating scooter on the market for a while now. 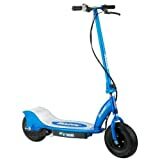 This electric scooter is ideal for kids above 13 years of age, travels up to 15mph, last about 40-60 minutes per charge and can carry up to 220lbs. The motor is chain-driven and pollution-free running only on electricity. The E300 takes and combines all the best features from its predecessors, just making them super sized! With its super-sized deck and frame, you won’t be wobbling when crossing cracks and curbs. The twist-grip acceleration is reliable, as well as the wide tires that can handle almost any obstacle in the way. See more of our favorite electric scooters here. The E300 allows for a unique combo of efficiency and power thanks to the 280-watt electric motor that remains sturdy time after time thanks to the chain driven mechanism that it runs on. The motor of the E300 is located at the rear end of the deck and is fully driven by a robust chain and reliable yet simple reduction gear. This chain-system lets the electric Razor scooters‘ wheels turn simultaneously, without damaging the motor as you prepare for take-off. As you increase your cruising speed, you will also be able to gradually hear the familiar chain-motor buzz that everyone loves. A tip to keep in mind: turn the motor off when you are not cruising and standing in place waiting! It’s definitely a great sound and can make any adult feel like a child again when whizzing by strangers on the street. If you have previously owned a traditional scooter, then this scooter + 280-watt motor combo will be a special experience to reinvigorate those childhood memories. Another proof this chain-driven motor is that even this pleasant hum is only able to be heard during the seconds when you accelerate. Otherwise, this efficient high-torque motor remains quiet and efficiently packed under the deck at the rear. No need to worry about angry neighbors or passersby, since most of the time they won’t even notice when you pass by. That’s why installing a small bell can be a good idea! The frame of the E300 is made of sturdy metals that will keep it from snapping in half during more aggressive rides. The scooter can definitely endure quite a lot of beating thanks to its body and is made to last and endure every-day rides, no matter where to, or over what terrain. The scooter frame also comes in white, blue and gray colors to suit all fussy tastes. You can securely hold onto the frame when riding over rougher roads without fearing about its durability. 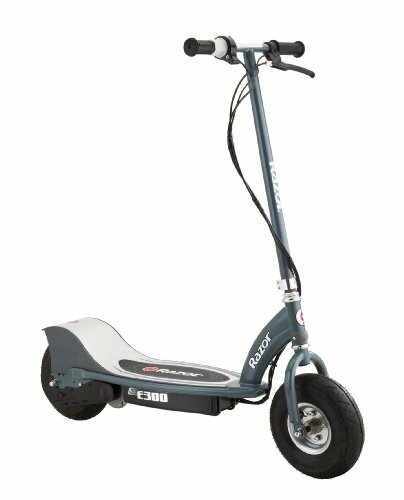 It’s a heavy-duty scooter than can endure heavy-duty use, and if the roads your town, home and city are rough, you should definitely take a moment to think about investing in the E300. It handles itself excellently in such situations, and the wide metal deck allows you to comfortably stand and ride. You can fit both feet easily, even more so than on the previous models that Razor has presented. This is why they decided to make the E300 slightly bigger, and more comfortable to ride. Gliding became more safe and more fun without worrying about slipping off the edge! All you need to do to pause your journey is squeeze the left handle-bar brake. This is exceptionally convenient since the right handlebar throttle controls the speed. This easy-access brake allows for instant stops whenever you feel the need to interrupt your gliding. Whether that’s to stop at the local shop, go to a friend’s house or to arrange a quick errand at work, the brake is efficient and effective, keeping you safe. Since the brakes are located at the front of the handlebars, they can be quickly grabbed and accessed should immediate danger arise in front of you. The single-hand brake applies a good amount of pressure to the rear wheel to encourage friction and resistance when stopping gradually. This ensures that you will be able to slowly pull to a stop without being thrown off the deck. One thing to keep in mind if you feel that your scooter is being a bit unresponsive is taking a look at the brake like tension. Many customers state that upon loosening this line, you can see a big acceleration in the overall speed of the scooter, and its endurance in general. The two thick, pneumatic wheels located at the front and rear of the scooter are made to endure smooth pavements and gravel roads alike. Even bumpier roads are handled exceptionally well thanks to the build of this scooter’s wheels. They are extra wide, and extra chunky so that you can ride and cruise without any problems down the local boulevards. The 10” pneumatic tires have a unique diagonal tread pattern that allows for very smooth gliding on even pavements. If you have a neighborhood and city with even words, you will be able to speed past regular bicycles and even cars stuck in jams. While smooth pavements are this scooters forte, more bumpy and sandy pavements don’t cause a particular problem, either. They may have a bit of a traction, but they can definitely ride over different surfaces. These big tires can carry anyone that weighs up to 220lbs, which is a great weight-ratio for adults and teens alike that new a new way of transport. The E300 has the ideal speed for any reliable commute scooter. It can travel at around 15mph for over 40 minutes. It’s ideal for getting around your neighborhood or town and is perfect for those times when you just need to run out to get a quick errand arranged. It’s a fast, quick way of transporting around and can be used by the whole family. Many customers report that some tall kids below 12 years old can even reach the handlebars comfortably. The twist and grip speed control is perfect for navigating around and increasing the speed of the scooter as you wish. It is, however, important to note that you can only get a15mph during the initial cruising, you cannot vary the speed. Only by applying the brake will you slow down! A twist of the throttle can make you speed as slow as fast as you can, giving you full command of the mph you want to travel at a given time. The speed of the E300, however, does decrease slightly when going uphill, which may be a problem for a neighborhood with more inclined roads. The E300 is equipped with a 24-volt motorized battery that can handle speeds that can go as fast 15mph. Spending time outdoors can be boring if you don’t have enough speed, and the E300 can definitely give you everything you need to enjoy your rides outside. You will be able to ride the E300 for up to 45 minutes per charge, which is perfect for trips to the shops or to see friends and family. However, you will need to also find time to charge the battery of this fine scooter, since it needs at least 10-12 hrs of charging. This means that monitoring the battery and the charging time is vital. Since leaving the scooter plugged in for more than 12 hrs can damage the mechanisms, it’s vital to keep a close eye on the green light. A continuous ride of 45 minutes means that you will be able to travel about 3 miles before the scooters give in. Luckily, you can also use your kick-power to move the scooter should you run out of battery half-way through your journey! The E300 comes with the large deck that is common with the E-model Razors. The bigger frames and wider tires help the rider keep a sturdy, balanced ride no matter where they ride. The kickstand is retractable and you will be able to use it whenever you feel like you need to pause. It doesn’t make your scooter tilt, tip or lean over, either. It’s a 100% sturdy and made from quality metal to help support your scooter when you’re not using it. It’s important to turn off the motor when you stop, however, to not damage the battery. The high-torque motor allows for a clean, quiet ride with no noise and the 24V batteries remain durable and dependable throughout everyday use. When assembled, the E300 equals to about 41″ x 17″ x 42″, while the product itself weighs around 46lbs. 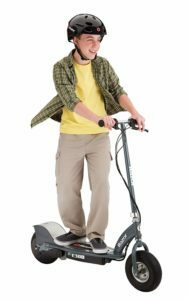 It may be relatively heavy for kids to carry or pick up off the ground, but teens and adults should easily handle the elecrtic scooter whenever they use it. Due to the bulkier, stronger build, naturally, the scooter does weigh a bit more. However, it’s justified by its durable frame and big, wide tires, which make the ride a fantastic, smooth, quiet and fun experience. Due to the bigger build, kids above 13 years of age should be perfect for this scooter. Naturally, younger kids who show sufficient levels of maturity can also give the scooter a go. 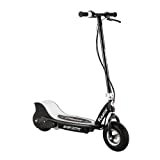 However, as a general rule, the E300 is perfect for older teenagers and for adults that need a new commuting scooter, or a scooter for fun cruises after work and/or school. We don’t recommend giving the scooter to younger children since it weighs a bit more than the regular Razor and can cause damage if it falls down. The E300 is perfect for anyone who wants to have a quick ride around the cul-de-sac or a quick trip to the corner store. It’s durable, the deck has a lot of space to stand comfortably with both feet, the frame is thick and sturdy, the motor is high-torque and 100% quiet, and the steel kickstand is a perfect addition for those who want to pause for quick breaks. The E300 has all the necessary features one could ask for to have a fun, enjoyable ride, no matter where they are!